In addition to a lifetime of free ingredients, is often possible for chefs/food businesses to offset the cost of tuition by selling specific wild food-based menus/events. For example: Saturday – personalised foraging tuition with Mark for chefs, Sunday – Mark leads organised foray for paying customers followed by meal using wild ingredients. I am also happy to try to help you identify plants and fungi online – but please read this first. You can send me an email, a tweet or contact me through facebook if you have any enquiries. Please make any non-urgent initial contact via email. I can send my mobile phone number if required. A common misapprehension about foraging, and especially foraging for commercial gain, is that it is exploitative, and undermines the “natural world”. Such views tend to ignore the hidden impact of commercially grown foods: all food has an impact on nature, foraged foods a good deal less than most! Outlooks that see all foraging as the same activity are grossly simplistic. Many species that occupy a forager’s attention are hyper abundant “weeds” that can cope well with careful picking for personal use and appropriate commercial harvesting. There is huge potential for improving our health and the resilience of local food networks through species/location-appropriate commercial harvesting. Read more on this here. 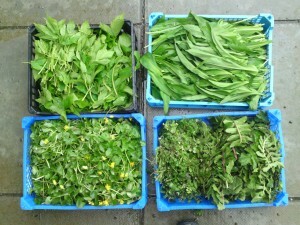 Personally, my days as a full time professional forager selling to up-market kitchens are behind me. I find picking things to order spoils the fun, and I much prefer to give away or trade any surplus I might have. But if you would like to buy/trade any of the wild foods you see on this site for business or personal use, feel free to contact me and I will see what I can do, but I very rarely supply, so you may well be disappointed. Wouldn’t you rather spend your money on tuition and pick your own for evermore…? 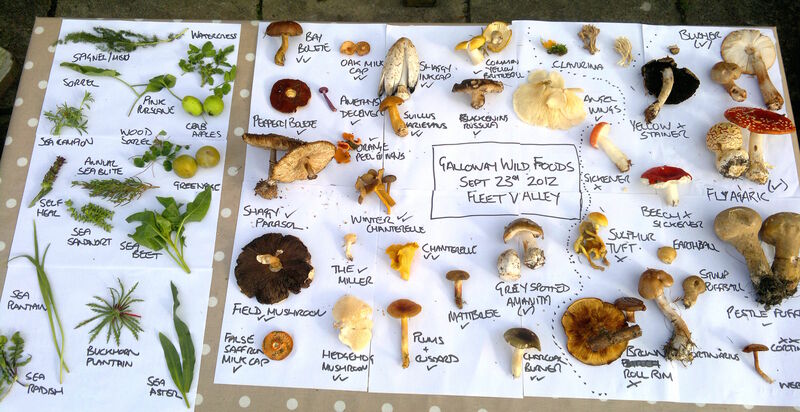 I attended the wild food “foray” arranged by Mark, on 13 August on the Cardoness Estate. The event was brilliant & I would highly recommend it to anybody & everybody. The entusiasm and passion that Mark has for wild foods is infectious. Thank you for a very entertaining, informative & different afternoon. I was reading the SWANK programme and saw the wild harvest talk by Mark WIlliams and wondered if it was the same guy from Arran all those years ago. It is. I live in New Galloway, have done since i left Arran. The Ken Bridge is Logan’s brothers hotel I think I’ll come along and listen to your talk. Lindy Renwick! Now there’s a name from the past! Conjuring up happy, hazy memories of beer and langoustine beach parties on Cladach shore, the Ormidale quiz, and my first ever fungi forage – still my busiest ever (100 people!?). Great to hear from you – just up the road too. I hope you and Logan are well and look forward to catching up with you at a SWANK talk soon. Keen to do a seaside forage with the family, but can’t make the 28th April, will you be running any more in the spring/summer? Hi Jim,Thanks for your interest. 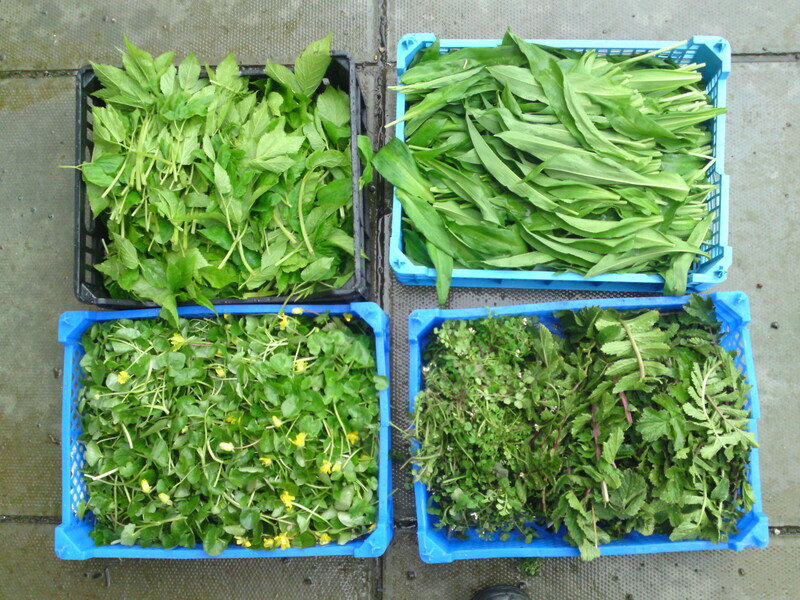 There is another coastal forage booked for Wed 9th May – see program. This will probably be better for kids as i’m hoping to do some spooting with the group. I am also doing a mixed coastal/woodland spring foray as part of Newton Stewart Walking Festival on Monday 14th May which doesn’t currently feature on the program. 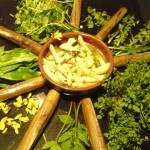 Do you have any Sea Kale roots, Reedmace flour, Acorn flour or leafy greens like Marsh samphire that I could buy to try? Or if you have none of these could you tell me what you do have? And yes, one day, soon I hope, I will also spend some money on tutition so that I can pick my own forever :0). Sorry, I don’t sell any of those things – and am not selling anything at present other than places on my walks. I hope you make one some time. 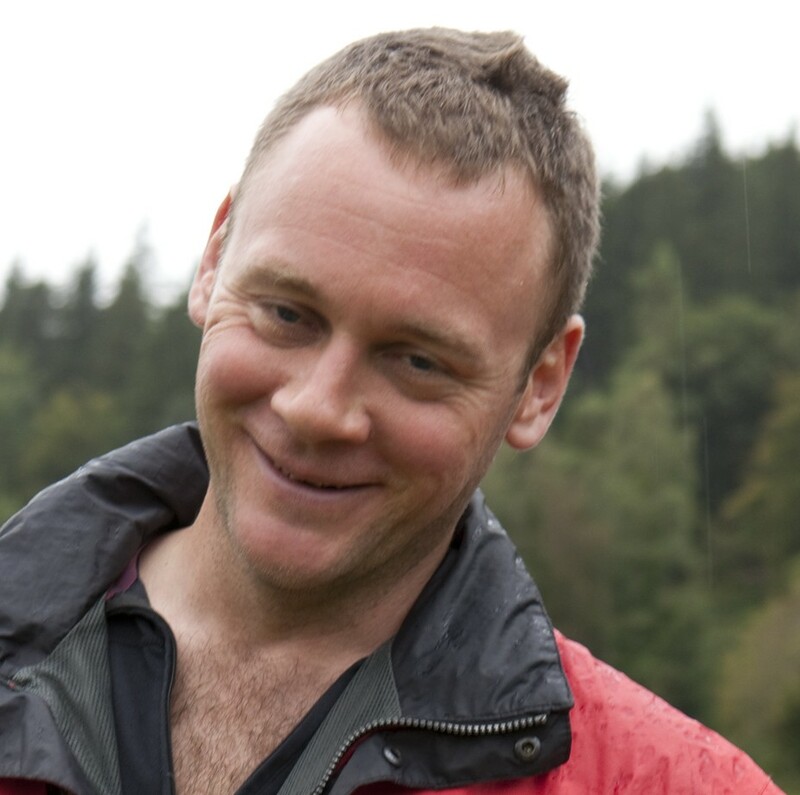 Hi Mark – really enjoyed the foraging trip and food afterwards at Wigtown Book Festival. A few friends are interested in a seaside forage particuarly for edible seaweeds in Ayrshire. Would you be interested? When’s the best time of year to do this, and what would the cost be? Thanks Liz, I have sent you an email. My friend Nick Weston of Hunter Gather Cook gave me your details. I am trying to raise money to get Glencoe Mountain Rescue a Land Rover Defender Rescue Vehicle. My good friend and business partner Shaun Bowden died last March, while we were walking in Scotland. The Glencoe Mountain Rescue team were fundamental in his search and recovery and they risk their lives in awful conditions for 100’s of people each year. I went back up to Glencoe a few months ago to revisit the area where the accident occurred and as we were driving along a very beautiful Glen, we saw a battered old Land Rover that was part of the Glencoe Mountain Rescue’s fleet of vehicles. That’s when I first thought how nice it would be if there was a Bowden Land Rover roaming around the area saving lives. So far I have raised £7000 and this year I will be participating in a few events including climbing Mount Blanc and running the Penny Fan to raise some more funds, but this is not going to be enough, so being a Land Rover, off-roading, Green Laning enthusiast I thought what better way to raise some money than by creating a 4×4 rally. The event content is really coming together, but we are looking to get as many people involved in the rally as possible, particularly 4×4 clubs and families who want an adventure. We are going to be traveling from Birmingham – Glencoe with stop overs in the Lake District and Glencoe. I’m in the process of building a website, we have a local media company who have kindly said they will help us with that side of things, if you might be able to come along to the campsites to give a foraging expo or even to come along and share a few stories around the campfire that would be the icing on the cake! Anyway, if you could give us your support we would be immensely grateful! Great stuff – I sent you an email. Hi, we’re looking to run an event in February, is there much to forage at that time of year? Hopefully, if there is, we can persuade you to come along? Thanks for getting in touch – I sent you an email. I am engaged in foraging/studying native food in tropical Northern Territory, Australia using our Aboriginal JAWOYN plants and animals book as a guide, these people have been doing this for forty thousand years and it is surprising the amount of edibles in an apparently barren landscape the only problem is that they eat the food or describe it as cheeky which can be bitter or toxic, this is an interesting experience and I would like to start something like you are doing, but at 81 I will be a bit slower, please keep the information flowing. Fascinating, thanks for sharing. Most of what is discussed around foraging today is actually a rediscovering of neglected and lost wisdom. Aboriginal people are a great example of one strand of our foraging heritage that has (just about) survived intact. We all evolved as foragers though and I believe we certainly haven’t evolved out of it yet – our energies and instincts are just often misdirected. I wrote more on this here. I look forward to reading about your experiences – please do send a link. If we come up to Scotland to do some foraging with you guys where’s the best area to stay nearby? I heard about your inspirational work on BBC 4’s The Food Programme and wondered whether you could give an indicative price for one of your foraging events, as I’m thinking of buying a gift token as a Christmas present. Thanks for getting in touch. Places on my scheduled walks range from £30 – £45, depending on location/sponsors etc. I run about 20 of these per year around Scotland and N England. I’m also available for private bookings, starting from £200. Hi Mark. Just heard you on Radio 4. I live in Glasgow and it was amazing and enlightening to hear you explore and talk about places I know. It occurred to me that some of these wild spices must also have healing and restorative properties. I’m not a car owner so it may be difficult to attend your workshops on location in Galloway. I’ll check your website but it would be great if you could let me know of any events nearer Glasgow. Thanks for a fascinating programme. Hi George, Thanks – so glad you enjoyed the programme. Many of the “spices” we discussed have medicinal properties, its just hard to know what to leave in and out when time is limited! I do quite a lot of events in the central belt – please keep an eye on my events calendar, which i’ll be populating with 2017 public events in the new year. I am also available for private bookings. I also heard you on radio 4 online on Sunday from as far away as Santiago, Chile where I’ve been living for the last 16 years and I have to say I got a wee bit nostalgic listening to you rummaging around!! I grew up in Dumfries but have since married a Peruvian chef and as I said we now live in Chile. I try and come home every two years and every second visit I am accompanied by my hubbie Andres. We plan to come over next year maybe May/June or September (I’m veering towards September, no flights have been bought yet) and I think Andres (and me too 🙂 would love to join you on a walk or something. You seem to be a busy man so I’m just wondering how far ahead we’d need to arrange something… I know nothing is set in stone but it sounds like fun, I will of course keep an eye out on your calendar too. Thanks for getting in touch. Lovely to think about you reconnecting with your homeland through our wee program, all the way over in Chile! Its great to connect with passionate food-lovers from around the world. I’ll be starting to schedule my 2017 events in the New Year, so hopefully one will fit with your visit. I will also email you my info sheet on booking me for private events. What a wonderful web site. Thanks to Radio 4’s Food Programme for making this know. As a botanist and forager I am impressed by the detailed information here and so well laid out that it is easy to find things. I’m looking forward to the Hogweed season. Thanks Gerry, so glad you enjoyed the programme and website. As you’ll be well aware, the original Charter was actually a foragers’ Bill of Rights. It would be a shame in my view if the modern commemoration had no input from foragers, and I can’t see the Association of Foragers among the supporters/sponsors/interested parties. I would have thought that their new charter for trees, woods and people, with a planned 15 or so chapters could incorporate a chapter on foraging. You might then be a good co-author. Certainly, they are currently asking for anecdotal contributions on the theme of woodland tales or encounters with trees, and I’d have thought that several of the pieces on your blog would be of great interest to them. would you be able to come and do a day foraging on Jura between 8-12th Aug? Hi Janet – i’ll email you some information.